See also the first installment, sequel 1, sequel 2, sequel 3, and sequel 4. The unabated flood of entries in our contest on nonsensical remarks about electronics continues on its merry way. Although the "type" of submission seems to have changed - there is a steady incoming flow of puns - we are pleased to see that this contest still has an enormous following. If you have heard a wild, implausible, or inane remark about electronics, why not tell us about it? Send it in and you may win a soldering gun, a prize that will help you "snuff out" some of those people who talk without thinking. Typical remarks have appeared in the July, September, November, and December issues. All About Wives. For some inexplicable reason, "wife" remarks are always good for a laugh and five of the better stories received in the past few weeks concern equipment repair as seen through the eyes of the female side of the household. One hi-fi service call involved what was obviously a frozen motor shaft in a record player. When this fact was announced, the offended housewife exclaimed, "That isn't true; it's never been that cold in this room.!" The electronic engineer's wife who is always phoning her husband in the office decided to take things into her own hands when the TV receiver went bad, so she phoned a radio-TV service shop. After she explained the trouble, and the shop diagnosed the symptoms, the wife hung up and then telephoned her husband to bring home an "intermittent tube." When another wife had the TV repairman come over to the house, it didn't take him long to spot the source of trouble, for there was the 300-ohm lead-in hanging a good 1" away from the TV receiver antenna terminal. When this fact was pointed out, the wife indignantly stated that she couldn't see "how come" the TV signal had traveled 25 miles through the air to get to the antenna and then couldn't jump this last remaining little gap. Then, there was the woman who had the repairman come in to fix the vacuum cleaner. Claiming that it needed new brushes, he removed a worn brush, placed it on the table, and said, "Look at this." The housewife exclaimed, "Well, I'll be! There's not a hair left on it." Finally, there was the housewife who had received a solid-state stereo receiver as a Christmas present; when the repairman arrived, he found that the a.c. cord hadn't been plugged in. Why not? Obviously, anything - according to the housewife - that uses transistors uses batteries. Puns, Puns, and More Puns. 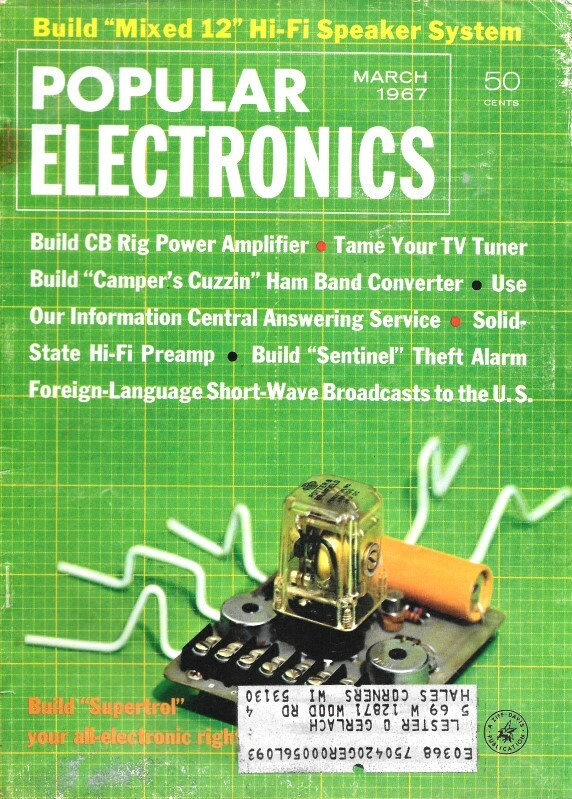 The 1967 Lafayette Electronics catalog has a "Tube Gadget" listed on p. 277. It is described as a "combination 7 and 9 pin miniature tube straightener and tube puller." It must be specially made for bent tubes .... A group of Californians that reconditions old cathode-ray tubes supported Ronald Re'gun for Governor .... Mad Magazine's Alfred E. Neumann exclaimed on seeing his new ham ticket, "What me W0RRY?" .... RCA Victor has a recording crew in Haiti taping some voodoo music - it seems they bought the rites. A woman in my neighborhood with a new color TV receiver had the repairman come over to delouse the picture tube .... Now that I'm interested in electronic espionage, my wife wants my bug detector to get the moths out of her closet .... A customer in a hi-fi salon rejected stereo discs, claimed she wanted some new multiplex recordings .... How come that raven in my room keeps saying "Neper More"? My soldering iron developed a short and my wife can't understand why I don't lengthen it ... Did you know that if you keep a roll of solder in the refrigerator you can make better cold solder joints? ... You've got to watch those store clerks; the last one didn't know anything at all about collapsible cable ... My wife's brother is so stupid he believes that if I hooked together all the batteries on earth I'd have a world series ... Did you hear about the fellow who thinks that heptode tubes are cool frogs? Winners. This month soldering guns go to Michael Breuning, Dennis Courtney, Bruce Feezel, Robert Fleischer, Leroy Ireland, J. V. Luczynski, Don Norwood, Bruce Potterton, Charles Saleeby, Larry Simko, Earl Switzer, and Byron G. Wels.